The scion of the noble Fuchoin family, Kazuki is often mistaken for a girl being that his fighting abilities emphasize on “grace”. His feminine looks come as an advantage to his job as an information seeker, making him one of the most knowledgeable characters in the series. He is often naive when it comes to the people he chooses to associate with, because he trusted Saizou Tofuin and Uryuu Toshiki even after they betrayed him. This undying form of trust is also what makes his true friends stay loyal to him. He uses koto strings as his primary weapon, and is so good that he is given the title “Prince of Fear”. 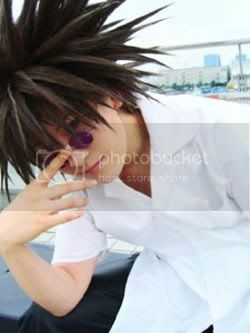 Obviously, this is a girl cosplaying Kazuki, but the characters does look and act like a girl anyway. Wonderful cosplay! Speaking of people with dangerous pointy hair, here’s a character who has such messy (and pointy!) hair that he is often nicknamed “urchin head”! The rude, and often arrogant Mido Ban, if the descendent of the Last Witch of the 20th Century. He is a genius in battle, and a natural born leader. And, though he’ll never admit it, he is very sentimental towards his friends and even those he is rude with. That is the most awesome looking Mida Ban hair! Another case of abusing hair cement like Kakashi? I heard using raw egg whites will also get you that result. You are currently browsing the archives for the Get Backers category.